Make your own fabulous nail creations. Use bases and pigments to create your own nail polish range. Use amazing glow in the dark colours and changing stickers for totally cool nail designs…. 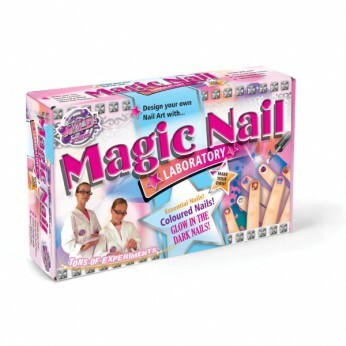 Create your own special formula nail polishes with the Wild Science Magic Nail Laboratory set. Use amazing glow in the dark and colour colour changing stickers to give your nails real style! It’s easy and so much fun to do on your own or with friends! Use bases and pigments to create your own special formula, solvent free nail polishes. The 12 page activity guide will show you how it’s done. All ingredients are gentle on the skin and can be washed off in warm water. Instructions included. General information: Size H19.6, W32.3, D7.2cm; Weight 370g; As seen on TV; For ages 8 years and over; EAN: 9313920037720. WARNING(S): Not suitable for children under 3 years old. Only for domestic use; To be used under the direct supervision of an adult. This toy costs approximately £12.99 (for the latest and best prices make sure you check our retailer list for the Wild Science Magic Nail Laboratory above). In our review of Wild Science Magic Nail Laboratory we classed it as being suitable for ages 5 years, 6 years, 7 years, 8 years but recommend you check the manufacturer specific advice before purchasing.